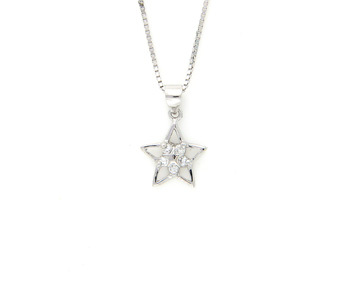 A White Cubic Zirconia and 925 Sterling Silver 'Star' Pendant finished with rhodium polish. The pendant is 1.8cms long and 1.1cms wide. The pendant comes with a 16" 925 Sterling Silver Rhodium Plated Chain. If you require any other length of chain then please see our chain section for options or contact us for details.